In which our hero heroine is courted by a yakuza heir and everyone thinks he's gay, Mori gets some character development is stoic as usual, and Kyoya loses his cool. The Yakuza heir attempts to confess to Haruhi, and is completely and utterly pre-emptively rejected. Whoops. Housekeeping: Every wednesday thursday we're ani-clubbin'. Find out more about the Ani-Club and how to participate via this finely crafted link. Rules of Ani-club apply: discussion is only for the series up to this point, no spoilers for later episodes. Reminder that nominations voting for the next ani-club series have started. Go forth and post suggestions vote. Episode 22: Guess they were trolling us with the implication that the episode had something to do with Mori. I guess he can't have too much presence or he might explode. Still a very enjoyable episode, and it was pretty funny to see Mori get depressed by everyone telling him he has a scary face and Honeys accusation that Mori is just using him. I also loved the bit where they broke the fourth wall to point out how Mori has barely spoken the entire series. Episode 23: It was nice to see a little continuity in the series. Bossa nova-kun is probably the only character outside the main cast to appear in two consecutive episodes. Some great gags as well. 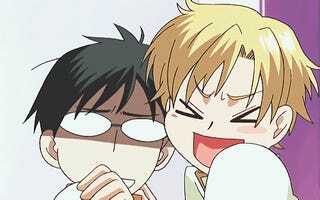 I was tickled at how everyone who didn't know about Haruhi thought he was gay. I still find it amazing that Renge still hasn't twigged despite the fact she's actually attached to the Host Club. And by attached I mean she lives under the floor of the music room eating rats between episodes. Episode 24: Another Kyoya centric episode. We've seen his third son complex rear its head before but I thought this episode did a good job going into it. Was very entertaining to see how Tamaki is pretty much the only person that can crack his cool and composed demeanour. Next episode the host club is shutting down! Well I guess it's the end of the series after all, this is the final week of this session of Ani-Club. Remember to vote for our next series and the intervening movie and remember to watch episodes twenty-five and finally twenty-six.